Although the term ‘topographical painting’ suggests connections with local geography, landscape and mapmaking, in the strictest sense topography means the portraiture of places. The topographer’s task was chiefly to gather information and record a view for posterity. The topographical artist was a true transcriber of what he saw before him, and although the accuracy of the representation varied with the abilities of the individual artists, their contribution to the body of historical record and to the development of art should not be underestimated. 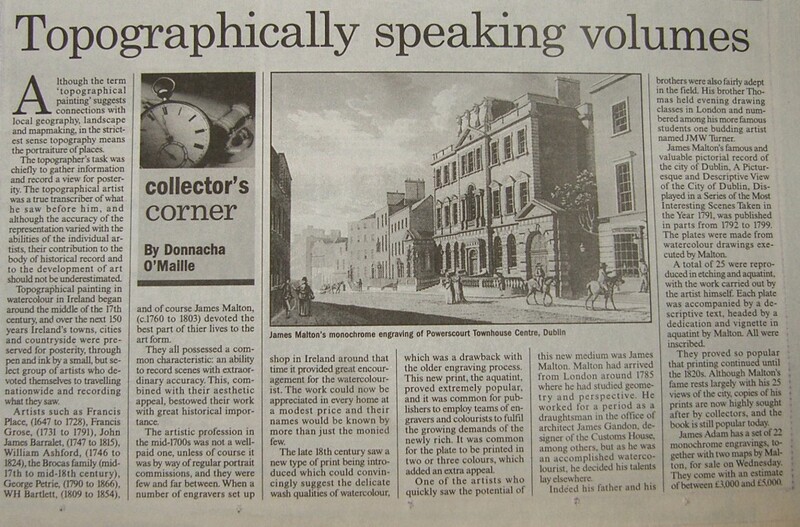 Topographical painting in watercolour in Ireland began around the middle of the 17th century, and over the next 150 years Ireland’s towns, cities and countryside were preserved for posterity, through pen and ink by a small, but select group of artists who devoted themselves to travelling nationwide and recording what they saw. Artists such as Francis Place, (1647 to 1728), Francis Grose, (1731 to 1791), John James Barralet, (1747 to 1815), William Ashford, (1746 to 1824), the Brocas family (mid-17th to mid-18th century), George Petrie, (1790 to 1866), WH Bartlett, (1808 to 1854), and of course James Malton, (c.1760 to 1803) devoted the best part of their lives to the art form. They all possessed a common characteristic: an ability to record scenes with extraordinary accuracy. This, combined with their aesthetic appeal, bestowed their work with great historical importance. The artistic profession in the mid-1700s was not a well-paid one, unless of course it was by way of regular portrait commissions, and they were few and far between. 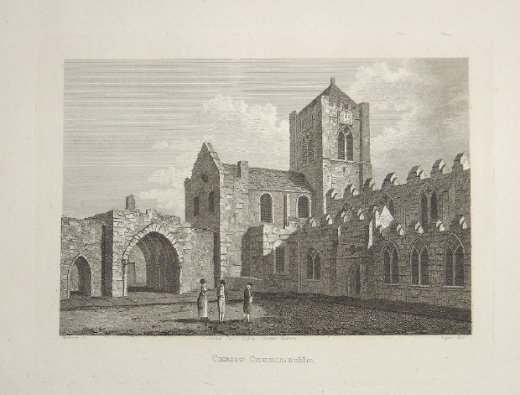 When a number of engravers set up shop in Ireland around that time it provided great encouragement for the watercolourist. The work could now be appreciated in every home at a modest price and their names would be known by more than just the monied few. The late 18th century saw a new type of print being introduced which could convincingly suggest the delicate wash qualities of watercolour which was a drawback with the older engraving process. This new print, the aquatint, proved extremely popular, and it was common for publishers to employ teams of engravers and colourists for fulfil the growing demands of the newly rich. It was common for the plate to be printed in two or three colours, which added an extra appeal. One of the artists who quickly saw the potential of this new medium was James Malton. 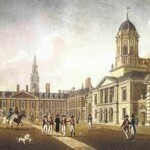 Malton had arrived from London around 1785 where he had studied geometry and perspective. He worked for a period as a draughtsman in the office of architect James Gandon, designer of the Customs House, among others, but as he was an accomplished watercolourist, he decided his talents lay elsewhere. Indeed his father and his brothers were also fairly adept in the field. His brother Thomas held evening drawing classed in London and numbered among his more famous students one budding artist named JMW Turner. James Malton’s famous and valuable pictorial record of the city of Dublin, A Picturesque and Descriptive View of the City of Dublin, Displayed in a Series of the Most Interesting Scenes Taken in the Year 1791, was published in parts from 1792 to 1799. 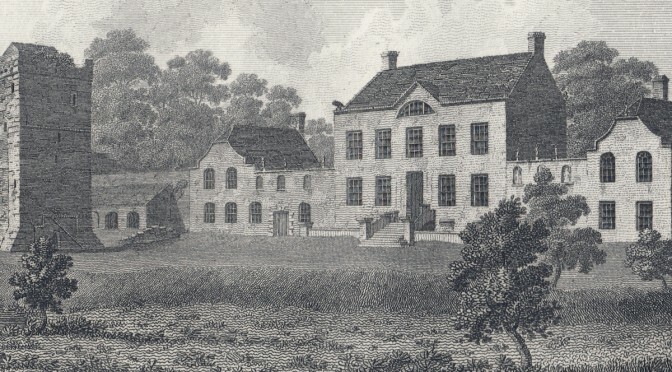 The plates were made from watercolour drawings executed by Malton. A total of 25 were reproduced in etching and aquatint with the work carried out by the artist himself. Each plate was accompanied by a descriptive text, headed by a dedication and vignette in aquatint by Malton. All were inscribed. They proved so popular that printing continued until the 1820s. Although Malton’s fame rests largely with his 25 views of the city, copies of his prints are now highly sought after by collectors, and the book is still popular today. James Adam has a set of 22 monochrome engravings, together with two maps by Malton, for sale on Wednesday. They come with an estimate of between £3,000 and £5,000.